Cynthia Macdonald, acclaimed poet and co-founder of the Creative Writing Program at the University of Houston, died last month at the age of 87. Macdonald began her career intending to be an opera singer, then switched to writing poetry. She published seven books of poetry, including Amputations (1972), Transplants (1976), W(holes) (1980), and I Can’t Remember (1997). Her work revealed an interest in the artistic, the freakish, and the domestic, a preference for pithy language, a dark wit, and delight in playing with form. 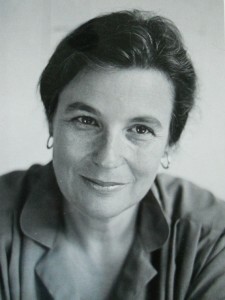 She was honored with a 1983 Guggenheim Fellowship among other writing awards. Macdonald came to the University of Houston after previously teaching at Sarah Lawrence College and Johns Hopkins University. In 1979, she founded the renowned Creative Writing Program along with fellow poet Stanley Plumly. Macdonald was considered an extremely knowledgeable and supportive instructor and mentor. In 1989 she received the Esther Farfel Award, the University of Houston’s highest faculty award. In addition to writing and teaching, Macdonald was a practicing psychotherapist who specialized in helping people with writer’s block. Also a mother, she leaves behind two children, Jennifer Macdonald and Scott Macdonald. 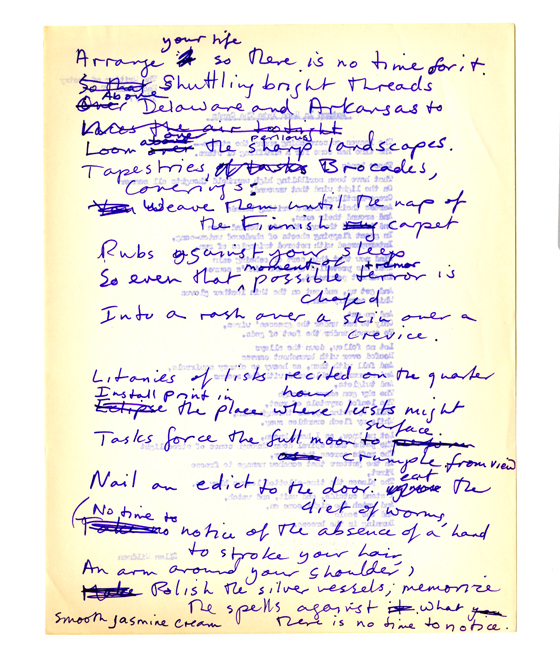 In 2010, the University of Houston Libraries acquired the Cynthia Macdonald Papers, a sprawling collection of manuscripts, correspondence, and materials from the writer’s teaching and psychoanalytical careers. 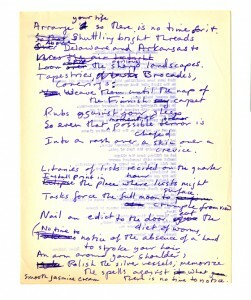 Special Collections also holds the Library of Cynthia Macdonald, a collection of over 3000 books, primarily contemporary American poetry, many of which were inscribed to Macdonald by her literary friends. With Labor Day behind us, we must begrudgingly say goodbye to summer. And while some students, enthusiastically or not, are just now settling down and getting comfortable with our grand academic pursuits regarding the diffusion of knowledge, other University of Houston students have been working all summer long towards that end. In the past on this blog we have featured some of the great work undertaken by student workers specializing in instructional support and assisting with our University Archives. However, under the supervision of our Library Supervisor, Nelda Cervantes, a team of student workers tackles the the lion’s share of grunt work necessary to allow UH Special Collections to carry out its mission of making our rare and varied materials available to current and future researchers. 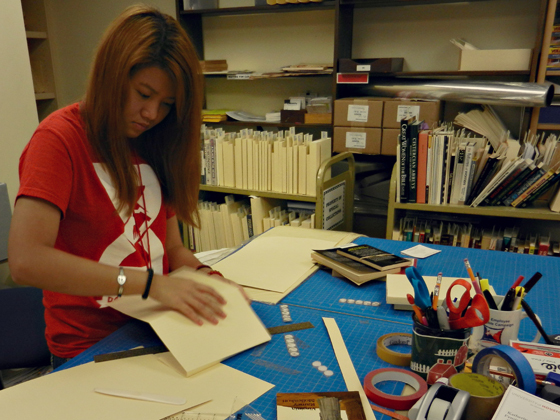 The summer of 2015 was no exception as the team of Gabrielle Davila, Huong Hyunh, Tammy Le, and Ricardo Uribe not only carried out the day-to-day tasks they have come to expect, but also took on a number of priority projects, directly impacting the campus and research communities here at UH. 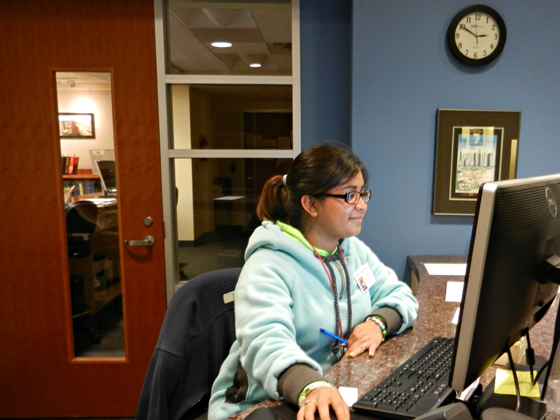 Student workers serve as the face of Special Collections, staffing our front desk and welcoming researchers to our reading room or students attending classes in our Evans Room. 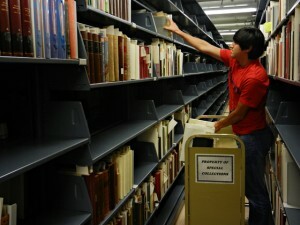 Visiting scholars will see them pulling requested materials, assisting with reproduction requests, and shelving materials when research is complete. Behind the scenes, they can be found assisting with the accessioning of books and archival material coming into Special Collections, doing the heavy lifting (quite literally) at the loading dock, labeling archival boxes and folders, manufacturing preservation housings for new acquisitions, and even taking out the recycling and trash. Simply put, if it needs to be done, they can do it. This summer, however, a number of additional projects also benefited from their talents and attention. Uribe and Hyunh assisted with the production of Dr. Terry Tomkins-Walsh’s exhibition, “Houston History: Archives, Magazine, and Oral History,” and Le even provided some last minute assistance with hors d’oeuvres prior to Houston History Magazine’s Summer Launch Party. When not mired in the minutiae of assessment and use data, Davila assisted Hispanic Collections Archivist Lisa Cruces with the inventory and organization of 18 boxes of books donated by Carlos Gonzales-Peña as well as material from the Kanellos Latino Literary Movement Book Collection. As new archival collections were donated and new acquisitions eagerly awaited a permanent place on our shelves, all of our students helped make space for the new arrivals throughout the summer, shifting and consolidating materials. Finally, Cougars through and through, they all eagerly assisted with the work of our Libraries’ Campus Engagement Committee as they produced and readied materials for our volunteers during the Weeks of Welcome. The commendations could continue, but it would appear the point is evident. 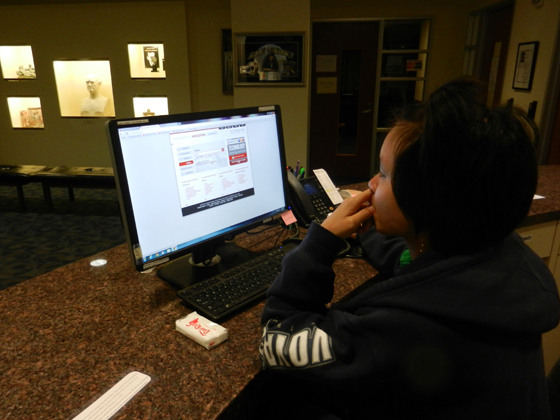 The UH Special Collections would not function fully if not for the tireless efforts of Nelda Cervantes and her team of student workers. Sadly (for us), Ricardo Uribe left Special Collections at the end of the summer to pursue other opportunities while completing his study of mechanical engineering here at UH. While we will miss his contributions, the work of our students continues now into the fall semester. We thank all of them for all of the work they have completed, and the work still left to do. As the fall semester ushers in a new class of Cougars, the University of Houston Special Collections also welcomes some new faces. Among them is Christian Kelleher who has recently joined the University of Houston Libraries as the new Head of Special Collections. Christian Kelleher, pictured here at the Benson Collection as part of an interview with StoryCorps. Kelleher comes to the University of Houston having previously served as Archivist and Assistant Head Librarian at the University of Texas at Austin’s Nettie Lee Benson Latin American Collection for over a decade. There, he worked to expand exhibition and instruction programs, helping to establish the Black Diaspora Special Collections program with the Warfield Center for African & African American Studies and building collaborative programs with the UT Law School’s Rapoport Center for Human Rights and Justice, assisting with the Papers of George Lister. 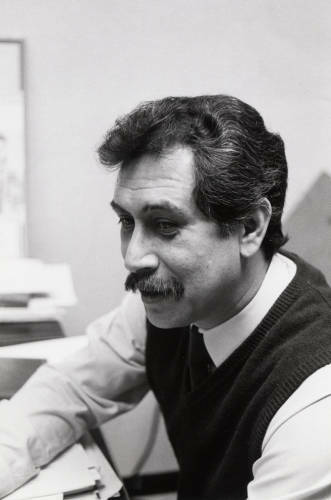 In addition, working with the Center for Mexican American Studies and the Department of Mexican American & Latina/o Studies, he began a series of archives workshops, including presenting to over 100 participants in the meeting of the Society for the Study of Gloria Anzaldúa. Beginning in 2008 he also served as Project Manager for the Human Rights Documentation Initiative. Among other duties in this role, he coordinated efforts to build and maintain the Genocide Archive of Rwanda (GAR) and the Digital Archive of the Guatemalan National Police Historical Archive (AHPN) on a post-custodial model. The GAR contains audio, video, photographs, testimonies, and more, seeking to prevent future mass atrocity and genocide through education, while the AHPN seeks to make available for remote study and scholarly research a digital iteration of over 10 million documents, the originals of which were discovered in 2005 and remain under the stewardship of the Guatemalan people. Kelleher brings with him experience in management, collection development, digital projects, grant projects, and outreach. He holds Master’s degrees in Journalism and Library and Information Science from the University of Texas at Austin, is a Certified Archivist, and has professional experience working in multiple languages, including French and Spanish. 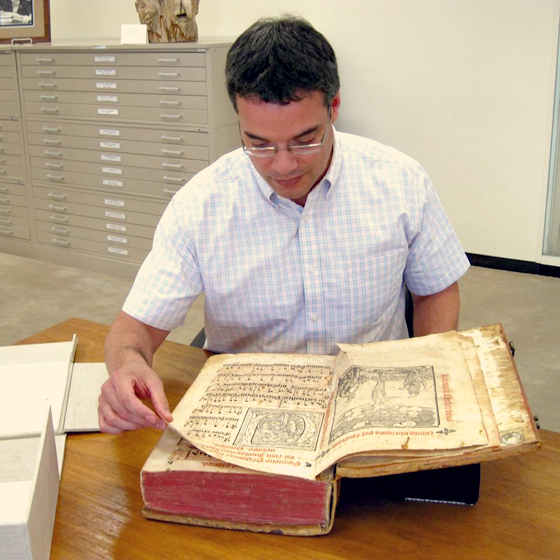 In addition to his experience at the Benson Latin American Collection, Kelleher has amassed experience working as an archivist in both the public and private sector. Working with History Associates Incorporated, he has consulted for the National Geographic Channel, the National Library of Medicine, and the National Park Service, among others. He accrued experience in nonprofit development while working at the literary publisher Graywolf Press, and even served as a Peace Corps Volunteer in the Republic of Guinea where he oversaw initiatives aimed at resource conservation and environmental education. Kelleher now looks forward to continue building on the work being done at the University of Houston Special Collections, supporting the teaching and research activities of the University and serving as a resource for the scholarly community and general public. Specifically, Kelleher aims to use his previous experience with high-impact online archives to help build and shape digital environments that will continue to introduce the rich variety and research potential of our primary sources to an international, scholarly community. In doing so, Kelleher seeks to reflect the diversity of the city and the University not only in our physical archival collections, but in our online presence as well. In addition, he seeks to extend our reach beyond the reading room walls, expanding our vibrant and engaging exhibitions and instruction partnerships, further integrating Special Collections into the life of the University, its students and faculty, as well as community partners. Please, join us in welcoming Christian Kelleher as the new Head of Special Collections at the University of Houston!